Bamboo is one of the most intriguing, unique plants known to man. Not only is it incredibly useful, it's also striking to look at. The strong, straight trunks give way to thin, wispy green leaves that sway and dance in the warm breezes. We've perfectly captured that unique essence in this stunning recreation. 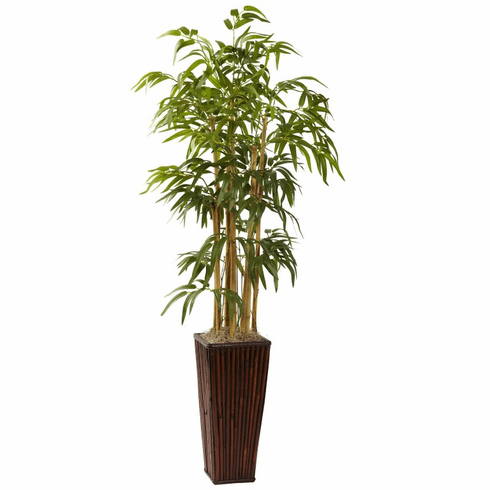 Standing more than four feet in height, this silk Bamboo will be the focal point of any room you place it in. Complete with a tall, decorative planter, it makes a thoughtful gift as well. Height= 4 Ft. X Width= 22 In. X Depth= 22 In.